According to Dr. Mizanur Rahman, the “human rights situation of indigenous peoples [in Bangladesh] is becoming worse day by day”. Dr. Rahman was among those presenting a new report by the Kapaeeng Foundation (KF), which examines the development of the human rights situation in Bangladesh in 2016. The report highlights multiple atrocities committed against indigenous communities throughout Bangladesh, ranging from systematic economic marginalisation and religious persecution to extrajudicial killings. It states that “in 2016, at least 23 indigenous fellows […] were killed in the [Chittagong Hill Tracts] and in the plains”. KF’s report also mentions those measures taken by the government in Dhaka which target foreign NGOs, severely limiting their ability to work in the country and speak out against injustices. Kapaeeng Foundation (KF) launched Human Rights Report 2016 on Indigenous Peoples in Bangladesh. The launching and dissemination program of the Report was organised on 26 February 2017 at Tawfiq Aziz Khan Seminar Hall of The Daily Star Bhavan in Dhaka. KF published this human rights report with the support of Oxfam. Former honorable chairman of National Human Rights Commission Prof. Dr. Mizanur Rahman was present as the chief guest while chairperson of Kapaeeng Foundation Mr. Rabindranath Soren presided over the program. Noted women rights activist and Nijera Kori coordinator Khushi Kabir, general secretary of Bangladesh Indigenous Peoples Forum Mr. Sanjeeb Drong and senior policy officer of Oxfam Mehbooba Yasmin were present and delivered their speech. The program was moderated by Falguni Tripura and vice chairperson of Kapaeeng Foundation Chaitali Tripura delivered welcome speech. Around hundreds human rights defenders, lawyers, academics, journalistsstudents, indigenous rights activists, civil society members, representatives of development partners, among others, were also present and discussants in the event. Mr. Pallab Chakma, executive director of Kapaeeng Foundation and one of the editor of the report made a presentation on the overall situation of human rights in 2016 on indigenous peoples in Bangladesh. Prof. Dr. Mizanur Rahman said human rights situation of indigenous peoples is becoming worse day by day. Indigenous peoples in Bangladesh has been unpeopling from the country. State should supposed to taking care of human rights violation of the country. But states fails to protect human rights of indigenous peoples in the country. Human rights violation of a single person threatens human rights of all other peoples in the society. Overall situation of the country will not be improved if violence against indigenous peoples continues. In the declaration of our independence being said that ensure equality, social justice and human dignity of all people of the country. We called human rights of these three together. But, is state is protecting the dignity of its dignity? he raises the question. The responsibility of the state is protecting the dignity ensure equality and social justice. But we see that police who are responsible to protect the citizens, they are involved in arson of Santal houses in Gaibandha. In this context, he said, Superintendent of Police of Gaibandha district has been transferred to Khagrachari. His job is transferable, then how the transfer is punishment for him? It is the people’s democratic state with a major intellectual fraud. State should bring into justice who is involved with human rights violations, until the end of the investigation should be relieved of his actions and should take appropriate action once the investigation ends. The former chairman of the National Human Rights Commission also said the state’s sole aim should be to put the welfare of every citizen. And it will be able to make our dreamsBangladesh, Bangabandhu’s golden Bangladesh. He also said that Bangladesh is becoming middle income country. But the human rights situation in the country does not improve as expected. Without the improvement of the human rights of the people development will not be succeed.Moreover the global human rights is under threat. So all of us have to work together for human rights. Khushi Kabir said there is no doubt the situation of human rights is not good in our country. People are being killed because of free thought, different culture, language does not welcome here. We must have to improve the situation. The district superintendent of Gaibandha is responsible for human rights violations against Santals is under investigation, how can he transferred to Khagrachari? He urged the government to notify the appropriate logic or reason. Ensuring indigenous rights is state responsibility. Indigenous Identity exist forever if state demolish their identity by calling as “Khudra Nrigoshti.” She said. Sanjeev Drong said the indigenous peoples of Bangladesh and the situation is going through the worst time ever. The important factor is how many incidents brought into justice instead of decrease or increase numberof human rights violations against indigenous people. He also alleged that not a single case of any incident brought into justice. No single perpetrator got punishment. He also expect that state will take step against all those perpetrators. Oxfam’s senior policy officer Yasmin Mehbooba said the human rights report on indigenous peoples of the country is helping us understand the true picture of overall situation of human rights. We will able to draw the way forward activity for indigenous peoples through the human rights report. In his concluding remark Rabindranath Soren said indigenous people had been tortured and forced to migrate to neighboring country due to not getting justice. Therefore, to protect the human rights of indigenous peoples, indigenous peoples have to fight unitedly. 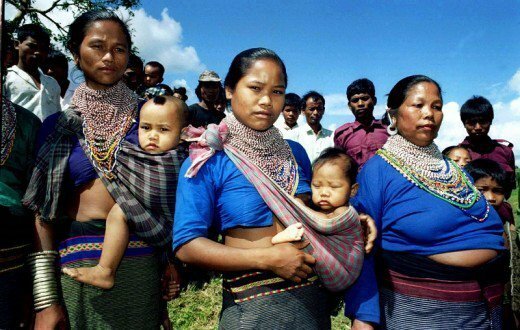 Indigenous peoples belonging to more than 54 different ethnic groups are known, as per available historical records, to be living across Bangladesh for centuries. 2011 census puts the indigenous population of Bangladesh at around 1,587,000 accounting for 1.08% of the total population of Bangladesh. However, indigenous peoples in the plains strongly dispute the 2011 census report on the figure of their indigenous population and claim that their population in the plains alone is estimated at about 2.0 million. Disaggregated official data being unavailable, the demographic distribution of different ethnic indigenous population groups remained uncertain. However, they were denied of their recognition as indigenous peoples when 15th amendment to the constitution passed on 30 June 2011 described them as “tribes, minor races, ethnic sects and communities” [Article 23(A)]. Instead they were labelled as “Banglaees” ignoring the distinct identities of indigenous peoples [Article 6(2)]. Bangladesh ratified ILO Convention 107 in 1972, but yet to bring about any positive change in the lives of indigenous peoples. The pledges of the government made in the 7th Five Year Plan to ensure legal protection to indigenous peoples by 1) implementing the UN Declaration on the Rights of Indigenous Peoples 2007 and ratifying the ILO Convention No. 169, 2) formulating a land policy to deal with land disputes involving ethnic communities and finally 3) ensuring the participation of local governments in the management of natural resources” are yet to be materialized. The Foreign Donation (Voluntary Activities) Regulation Act, passed in October 2016, and the proposed amendments to the Press Council Act are considered by many as instruments to control NGOs freedom of expression and association and for gauging newspapers respectively. On the other hand, a government directive in 2015 requiring individuals of national & foreign organizations to ensure presence of local administration, army/BGB in any events they wish to organize in the CHT, in fact, placed severe restrictions on them. In the year under review, the indigenous peoples continued to be dispossessed of their lands, the mainstay of their subsistence, as land grabbers’ drive for robbing indigenous peoples’ land using forged land documents, intimidation, gaps in country’s legal system and patronage from the establishment persisted. Legal battle proved futile as there is almost no evidence of restitution of land won in the law court. Bangladesh claims to have achieved the status of a lower-middle income earning country. However, there is no reflection of this achievement on the lives of indigenous peoples, who still a wait to be lifted out of the cycle of deprivation of rights and marginalization of opportunities. The continuation of the existence of indigenous peoples with their distinctive identities in this country is still threatened. When spaces for accountability, rule of law, democracy and transparency in the country are narrowed down, the miseries of indigenous peoples are destined to be aggravated. However, it is reassuring is that the civil society and media of the country are getting vocal about indigenous peoples’ rights as well as the implementation of the CHT Accord. Despite the presence of a prejudiced section among the mainstream population against indigenous peoples’ aspirations, a number of support-networks among them have started coming up, though their activities are yet to gain necessary momentum. Indigenous peoples need political access to fight for their rights and to hold their governments accountable. The key to stimulating the struggle for human rights of the indigenous peoples lies in their greater political inclusion. Discrimination is widespread in the behavior of public officials both at the national and local level and in the attitude of political parties. The government’s attitude, too, towards indigenous peoples reflects their hegemonic and discriminatory views. In the last Union Parishad elections held from 11 February 2016 to 4 June 2016 throughout the country, none from among indigenous communities in the plain land could have been elected as chairman, though more than half of indigenous population of the country live there. Unlike in the plain land, chairman candidates from indigenous communities in the CHT won elections in the 83 Union Parishads out of 115 in three hill districts. However, though there is a concentration of indigenous population in the CHT, no single Mayoral candidate from indigenous communities was elected in elections to any of 7 municipalities (pourasavas) in the CHT held in December 2015. The Supreme Court in one of its rulings restrained law enforcement agencies from making arbitrary arrests on suspicion. However, in spite of the ruling, there is a growing trend of making arbitrary arrests, detention and enforced disappearances in the country and members of law enforcement agencies involved in such crimes enjoy full impunity. In 2016, criminalization of activities of Indigenous Peoples’ Human Rights Defenders (IPHRDs) and IPOs by state and non-state actors continues both in the CHT and in the plains resulting in arbitrary arrests, detention and intimidation of them. In 2016, fabricated cases were filed against at least 191 IPOs and IPHRDs activists including 42 innocent indigenous villagers in the plain land, while 80 activists including 3 public representatives were arrested and more than 81 persons including 4 from the plain land were detained briefly. In 2016, at least 23 indigenous fellows (including 6 indigenous women and girls, please see ‘Chapter IV: Situation of Women and Girls’ Rights’) were killed in the CHT and in the plains. Despite the rulings against extrajudicial killings by the Supreme Court of the country, quite a number of indigenous peoples were reported to have been extra-judicially killed in 2016. The most ghastly and atrocious incident was the killing of 3 Santals in Gaibandha by police firing. At least, 96 members of indigenous communities were physically tortured and harassed, and 297 houses including a Buddhist Temple were searched and ransacked by law enforcement agencies while conducting a search operation. At least 3 communal attacks by fanatics, land grabbers and settlers were carried out against indigenous peoples in which their houses and properties were destroyed and looted. As many as 200 houses belonging to indigenous Santals were set on fire and burnt to ashes by land grabbers in presence of the law enforcing agencies and security forces in Gaibandha district in November, 2016. In a video of this incident that went viral in the electronic and social media, police were seen setting fire to the indigenous Santal houses. The district administration in the CHT were alleged to be indulged in forbidding assemblies and rallies organized by various IPOs. For instances, Khagrachari district administration and law enforcement agencies prohibited, on a number of occasions, formation of human chains organized by IPOs and Civil Society organizations including a 300 kilometre-long in the three hill districts of the CHT on 9 January 2016 demanding for proper, speedy and fullest implementation of the CHT Accord and formation of an independent Land Commission for indigenous peoples of the plain land. This is also disturbing that despite constitutional guarantee in regards to equal status and equal rights in practicing any religious faiths other than Islam, there were alleged reports of religious persecution on indigenous peoples and other religious minorities continues.